Dana Lauren Berry has been named Director of Public Relations for the new Four Seasons Hotel Denver. Berry formerly was Director of Public Relations at Magnolia Hotels before launching Dana Lauren PR. How’s this for irony: A week after accepting PRSA Colorado’s “Business Person of the Year” award at the organization’s annual awards gala, Pinnacol Assurance CEO Ken Ross (allegedly) had to be restrained from attacking KMGH/Channel 7 investigative reporter Tony Kovaleski and threatened to break the reporter’s finger. The confrontation (allegedly) took place at the famed Pebble Beach resort in California, where Pinnacol was hosting a controversial junket for board members and its top sales brokers. Following a golf round on May 13, Kovaleski asked Johnson about whether it was appropriate for him to be on the trip. “What do you think the governor is going to think about you taking this kind of golf with you and your wife,” Kovaleski was asking (Pinnacol board chairman Gary) Johnson when Ross interrupted and prevented the board member from answering. Ross, on the 18th hole, seemed very agitated. “You point your finger at me again, and I’m going to break it,” Ross said while pointing his finger at Kovaleski. He turned to the camera and demanded that it be turned off. “This has nothing to do with Pinnacol,” Ross said. CALL7 Investigators were tipped of to the trip by a source who had information from inside Pinnacol. Ross, who was being restrained by colleagues, surged at Kovaleski. “Please, don’t push me,” Kovaleski said. JohnstonWells has been selected by T1 Visions, a technology company that specializes in interactive touchscreen solutions for restaurants around the globe, to conduct a national media campaign. Among those hiring this week are GroundFloor Media, Metzger Associates, tw telecom, NREL, Allstate, Cambium Learning Group, Colorado Tourism Office and the U.S. Dept. of Labor. 0 – Number of group shots on the Dovetail website in which CJ Powell appears (time to learn Photoshop, CJ). What do you get when you combine tequila, Boa Energy Drink, DJ Tower, cheese and Jennifer Lester? If you guessed “arrest warrant,” well, you’re probably not wrong. 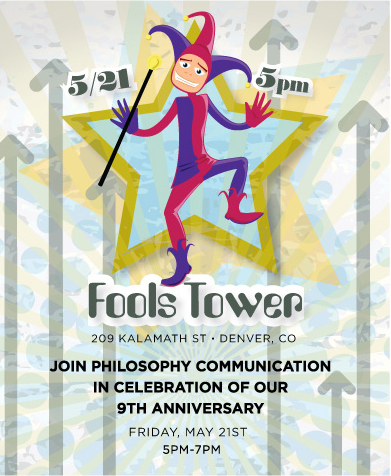 But the correct answer is Philosophy Communication’s 9th anniversary party tonight. Additional details are here.